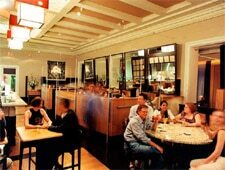 Sleek and upscale, Poste recalls Washington's glory days. : Entering Poste takes one through an elegant courtyard and up a stone staircase; a sleek modernity has transformed this once-historic General Post Office building that dates from 1841. But somehow, the grand charm remains in what almost seems like a European enclosure. A lounge area hosts Washingtonians (and visitors too) sipping and sitting graciously far into the evening. There is a modern bar and dramatic dining area with its various levels and bird's eye view of the display kitchen. Service is fast and efficient. Try a bowl of steamed mussels and a roast chicken half over mashed potatoes---good, though not memorable. Entrées, which change seasonally, may include braised short ribs, various fish and shellfish offerings, and maybe lamb. Dessert possibilities may include a plum galette, a dessert du jour, Bavarian cream and a selection of ice creams. The wine menu is carefully composed and the staff seems eager to help you make your selection. While outside Washington hums, inside Poste soothes and pleases.